In March 1916 the design was begun of a 120-hp Beardmore-powered tractor replacement for the B.E. pusher scouts. The type was designated R.2A and was intended to be armed with one wing-mounted Lewis machine-gun and another for the observer on a Scarff ring. At the same time a similar design using the 150-hp Hispano-Suiza was produced, but lack of power from the Beardmore caused the designer, Captain Frank Barnwell, to produce a new design using the new 190-hp Rolls-Royce Falcon and with the designation F.2A. 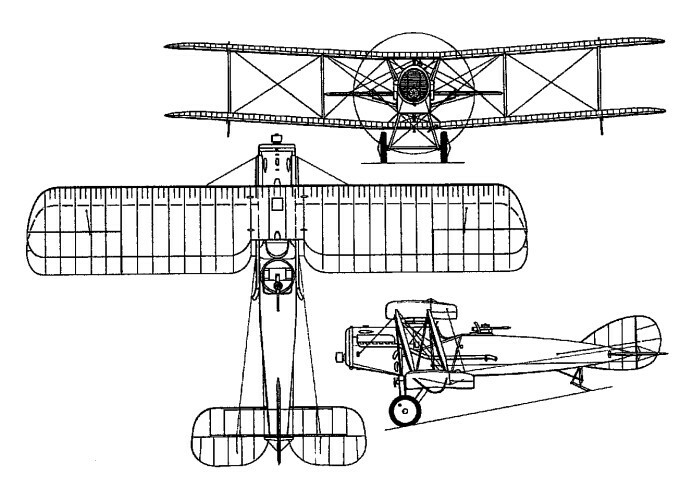 This was an unequal-span two-bay biplane with its fuselage, tapered to the rear mounted mid-way between the wings. Two prototypes were completed by the early autumn of 1916, one with the Rolls-Royce Falcon engine (A3303), the other with the 150‑hp Hispano‑Suiza. 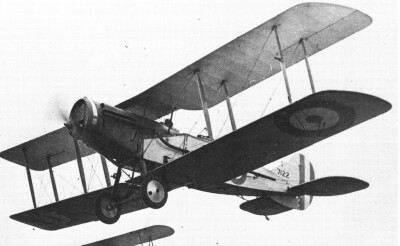 Prototype A3303 was first flown at Filton on 9 September 1916, and after successful trials a first batch of 50 Rolls‑Royce‑powered production F.2As was ordered with a syn­chronized Vickers machine‑gun mounted in the top of the engine cowling in addition to the Scarff‑mounted Lewis, entering service with No.48 squadron in February 1917. Meanwhile the second, Hispano-Suiza-powered, prototype had been modified to improve the pilot's view and given a larger fuel tank, increased ammunition stowage and a modified lower wing affording a small increase in gross area. New horizontal tail surfaces of greater span and increased aspect ratio were introduced. Further production machines were ordered with the 190-hp Rolls-Royce Falcon I and the designation F.2B; after the first 150 the 220-hp Falcon II was substituted for a further 50, and production was intended to continue with the 275-hp Falcon III. F.2B deliveries began on 13 April 1917, and the success of this type led to the decision to re-equip all RFC fighter-reconnaissance squadrons with F.2Bs. By the autumn of 1917 production of the aircraft was outstripping that of the engine, and the 200-hp Hispano-Suiza was substituted in the aircraft intended for reconnaissance squadrons, but this proved unreliable and was replaced by the 200-hp Sunbeam Arab in a modified nose. Some later F.2Bs were fitted with the 220-hp Siddeley Puma and a number of subcontractors were given contracts to produce the F.2B, 3050 being completed by the end of 1918. Production continued until September 1919, by which time a total number of 4,747 had been completed, 3,126 of these by the parent company, the last to the RNZAF. Of the final batch, 153 were delivered with the 200hp Sunbeam Arab engine and 18 with the 230hp Siddeley Puma. When the RAF was re-established on a peacetime footing, the F.2B was adopted as standard for the army co-operation role and reinstated in production for this task as the Mk II, others being refurbished to similar standards. Fifty structurally revised aircraft delivered in 1926 were designated as Mk IIIs, all surviving aircraft of this mark being converted in 1928 as dual control Mk IVs for a final total of 3,576. It was finally withdrawn from RAF service in 1932. The greatest number of F.2Bs used the Falcon engines, however, and it was these fighter/reconnaissance machines which won the Bristol Fighter its reputation though only after some severe early setbacks. The first F.2A unit to arrive in France was 48 Squadron, RFC, in March 1917, and their first patrol ended in disaster. On April 5 six of their fighters were attacked by Manfred von Richthofen's Jasta 11 and four were shot down. Further combat failures followed before it was realized that the fault lay in the tactics, not in the aircraft. Previous fighting scouts had the observer's gun as their primary-if not only-armament, but the F.2As synchronized Vickers was a much more potent combat weapon, and once the pilot's learned to aim the whole aircraft at the target the Fighter never looked back. F.2Bs of 48 Squadron accounted for 148 enemy air-craft by the time of the Armistice. As well as mounting offen-sive scouting patrols, F.2Bs were used as bomber escorts and bomber intercepters and on, ground attack missions, for which they could carry up to 12.9-kg (20-lb) fragmentation bombs. Because of their success their introduction to reconnaissance squadrons was delayed almost until the end of the war. Bristol Fighters also served with distinction in Italy, while in Palestine they equipped 1 Squadron of the Australian Flying Corps. Ross Smith of 1 AFC scored the majority of his victories with the F2B. Numbers were also used by Home Defence squadrons. 3,101 were produced through the end of WW 1.Bristol Fighters also served with distinction in Italy, while in Palestine they equipped 1 Squadron of the Australian Flying Corps. Ross Smith of 1 AFC scored the majority of his victories with the F2B. Numbers were also used by Home Defence squadrons. 3,101 were produced through the end of WW 1. The US Army had become interested in the type when the United States entered the First World War in 1917, and a contract for 1,000 planes placed with Fisher Body Corp was cancelled and reassigned to Curtiss, to be powered by the 400hp Liberty 12. The Liberty proved too heavy for the airframe and was responsible for a series of crashes. McCook Field experiments on the pattern plane supplied by RAF (A7207) showed that its Hispano-Suiza was the ideal match, so the contract was cancelled in July 1918 after 26 planes (AS34232/34257) had been built as O-1. Most of those were rebuilt with a monocoque plywood fuselage and refitted with 300hp Wright-Hisso H, others experimentally with 280hp Liberty 8, and all redesignated as B-1. In 1918 Curtiss did scratch-build one British SE5a fighter, and assembled 50 more from British parts, and all used the 180hp Hispano 8-B. Wing chord: 5 ft. 6 in. Armament: 1x MG 7,7mm Vickers, 1x MG 7,7mm Lewis, 2x45kg Bomb.